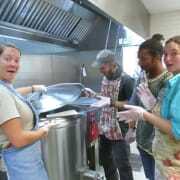 We are in need of volunteers in our Community Kitchen on Friday, Saturday, and Sundays. We offer two 5 hour shifts: 8:30am-1:30 pm and 1:30pm-6:30 pm We do ask that you are able to stay the entire 5 hours. You will assist the cook with food prep and help serve meals under the direction of the cook. Dress code: No open toe shoes, and wear comfortable clothing. Nothing too tight or too loose. We do offer hairnets, although, you are welcome to bring a baseball cap or scarf. No offensive language on clothing please. If you need any school paperwork signed for proof of hours , please bring it with you on the dates you volunteer. Minimum age is 16 yrs old. You'll be greeted by one of our cooks and directed from there. Please contact Kyra at 218-336-1046 or by email at kgustafson@damianocenter.org to get on our schedule. Once scheduled, please understand that we certainly do count on your presence and schedule accordingly. Each volunteer is appreciated very much and we couldn't operate without you. No drop ins please. Thank you.